We agree. It’s confusing! 😀 And at ThemePunch we always want to help, so we always answer questions whenever possible. But if you received the standard response, it means your question/issue requires an investigation… aka “support”. So why can’t we provide support for the bundled version? Only thing is, in the above scenario, the plugin author doesn’t receive any additional royalties on the theme sale. Instead, they just earn 5x the cost of the regular price (around $100 after fees). 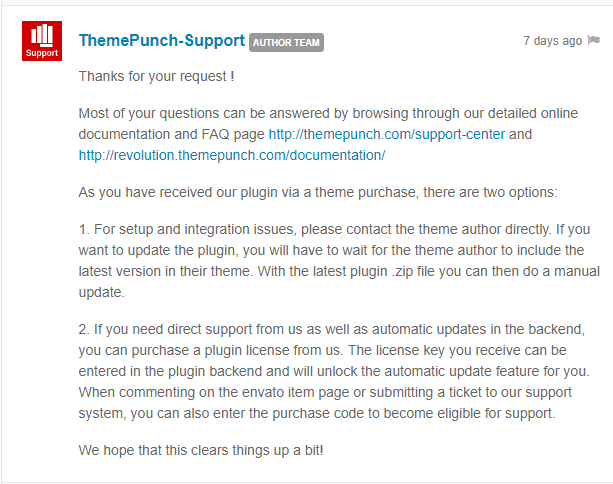 So why does ThemeForest allow theme authors to bundle plugins that don’t include support? Because it’s a win win for everyone. The plugin author makes a sale. The theme author adds even more value to their amazing theme. And you get a great theme with some of the most popular plugins included at an amazing cost! And here’s a list of all the benefits included with the Premium Version of the plugin in addition to our famous 5 Star support. Hoping we get a chance to talk with you over at our support center! My support has expired. What are my options?